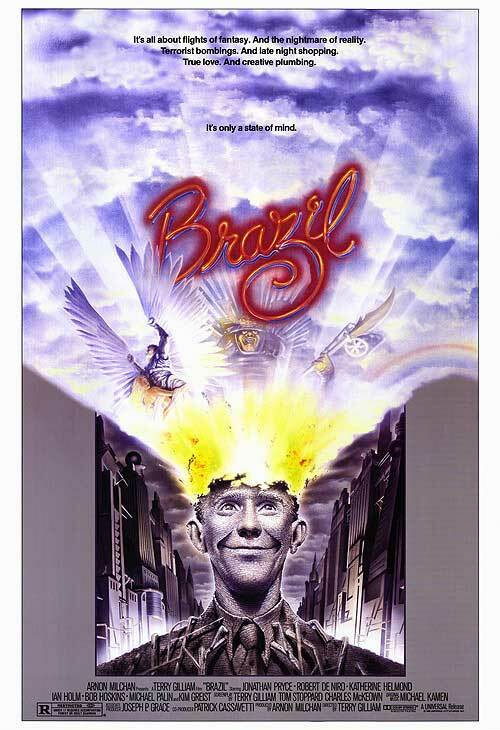 We continue Revolution Week with a film that has after today become a favorite…”Brazil.” Terry Gilliam is truly a master of surrealism and satire as well as creating films with so many intricacies and layers. It is easy to relate this film to revolution because it represents everything being rebelled against. It is a static world but the characters are not static. There is a fight change things and characters change as they are put through trials both figurative and real. This was my second time seeing the film. First time I just didn’t get it. It was wierd, tonally inconsistent and too long I felt like. After a second time seeing it, since last time I saw it was in college, my views have changed. Some of those issues still stand but there are a hell of a lot more ways how it is brilliant and works. The film was directed by Terry Gilliam who also was one of the writers. The other writers of the screenplay were Tom Stoppard and Charles McKeown. The film was produced by Arnon Milchan. The premise is that Sam Lowry (Jonathan Price) is a low level government employee fantasizing about being free in fantasy dream who is pulled into events that soon change him though as he has to rectify an error that occurred that led to the government executing an innocent man. From here the story unfolds as the revolutionary Harry Tuttle (Robert De Niro) (the man supposed to have been killed) uses his home as a base and Buttle’s neighbor Jill Layton (Kim Greist) seeks justice for what the government did. The Pros: The World – The World is a surrealist representation of our own. With old ladies getting face lifts, government bureaucracy where papers rain down from the walls and a faceless police force breaking into homes…all over a consumer driven society obsessed with wealth. It is a brilliant exaggeration of the problems in our own and satire at it’s finest. The Government – The government in this world cares more about the “Right way” to do things and the documents to sign and agencies to visit rather than people. We see this in how Jill is unable to get the right documents to get money for the Buttles or to hold anyone accountable. The government is all about personal connections too, since Sam’s Mom knows someone higher up Sam is able to get the promotion into Information Retrieval which helps him to save Jill when he learns Information Retrieval via his “friend” Jack is targeting all those connected to the government mistake. The Rebels – Tuttle is our greatest glimpse of the rebels and they like society are mad. They do small things and also big things like setting off bombs in public places. They are also human too, as witnessed by Tuttle being one of the few people who actually treats Sam like a human being. They do have issues though, all the attacks we see happen in public places and is largely innocents killed, which is probably why the government is still in power. In order to have a successful revolution you have to win the heart of enough of the people. Jack – Jack is the torturer and assassin for the government and was the one who killed Buttle and is now killing everyone attached to him. Everyone knows what he does too as his daughter is in the room with him where he had a doctor’s outfit covered in blood. He is a family man and does try and protect people he must care about to some degree, but he is also a cog and disconnects himself by wearing a baby mask when he tortures people and forcing them to not see him as a person. Harry Tuttle – Harry is the revolutionary and the one who saves Sam at one point. To Sam he represents freedom and letting go of all he was attached to that was crushing him in his work (“Fight Club” style) but is also a real human being as we see him interact with people beyond Sam. He connects to those who help him but clearly doesn’t care about the masses. He is selfish in that he is mostly looking after himself, even if he is fighting the system. De Niro is fantastic. Jill Layton – Jill is the activist and goes through all levels of government to try and get justice for Buttle. She doesn’t succeed but ends up finding an ally in Sam who she at first hates but later when she learns he was right about the injustice of the government joins with him as they are both on the run. She is killed when Sam is captured sadly. Kim Greist does a good job. Sam Lowry – This is the best role I’ve seen Jonathan Price in. He plays the government worker just trying to live day to day by living in a fantasy half the time, to the fugitive and also the rebel to some degree as he holds out against in the torture in his mind and doesn’t give in or reveal Buttle to Jack and the government. The price is he goes mad and lives in his fantasy, which gives him a very bittersweet end…considering this could have gone “1984” and turned him into someone who is all about the government and right way to do things…as he was at the beginning of the film. The Dream – There are two dreams. The dream where Sam is saving Jill from an enemy, in one it’s a Giant Samurai…and one where he is rescued by Tuttle who he destroys the government building with. He later ends up at his Mom’s friend’s funeral, is hunted by the government and watches Tuttle be devoured by government documents before he is rescued by Jill. This is his ending after his mind breaks. The Message – The message is in the satire. Obsessing over things like wealth, body and items make it easy for a corrupt, inept and controlling system to take control. This makes sense as people in a state of complacency don’t care. The message of the film is to wake up and do something that matters. Try to change things and notice the problems in the systems around you. It is a powerful and great message. Okay: The Cogs of the Machine – Most of the government employees don’t feel like real people. Besides Jack, none of them felt fully fleshed out. They were just that, cogs which may have been the point but it’s why I can’t put them as a pro. The Everyday People – The everyday people are the same way. We see glimpses of connections and life, such as the family celebrating Christmas together before the government arrives to arrest the father…but beyond that we don’t really get to know the people beyond Jill and Harry. The Cons: Confusion – The dream sequence at the end was a bit confusing until the reveal, and there were parts in the middle that were the same way too. This limited the power of the message in my opinion. Too Long at Times – There were times the film dragged…for example some of the dream sequences that Sam has with enemies like the Giant Samurai and others were cool, but they really did go on for too long. This isn’t my favorite Terry Gililam film, that is still “The Fisher King,” but this one is truly amazing and a well deserved Cult Classic. It satirizes problems relevant to our time and does a call to action in the process, which is really the basis for the act of revolt and revolution. Revolutions are about facing a problem and through struggle seeking to change it. This movie is how one person failed at that and how sometimes the means can be truly bad as well. Suffice to say, I recommend this film. Final Score: 9 / 10. Solidly great, even with the problems I have with it.